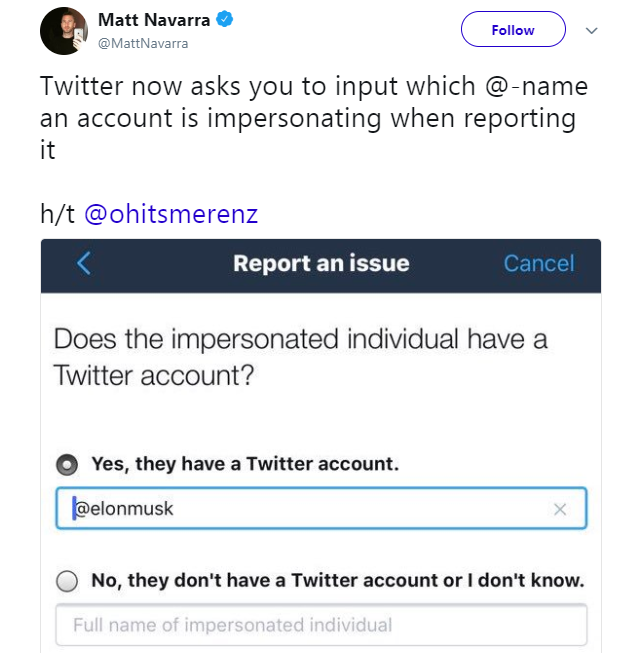 Matt Navarra, a social and digital media consultant, reports this new Twitter update, with which one would have the option to give the @ name of the user, who is believed to be impersonated on the social medium. With this new feature, when a user reports an account for impersonating another person, the platform would ask if the reporter if he/ she has knowledge about the victim's real Twitter account, and his/ her username. The user may or may not share that information, depending on his/ her knowledge. This new step has been appreciate by users, who regard it as a "much needed update".